The sky is a sight in itself in Lapland. All photos by Susan McPherson. This week on Popupla, we're featuring people who inspire us. Like Susan McPherson, a fierce advocate for women who helps companies both big and small learn how to be socially responsible. We followed her around on a solo trip to the Arctic. LAPLAND, Finland – On the heels of the chaotic New York City holiday rush and the horrendous 2016 presidential campaign, no place on earth seemed farther away than the North Pole. 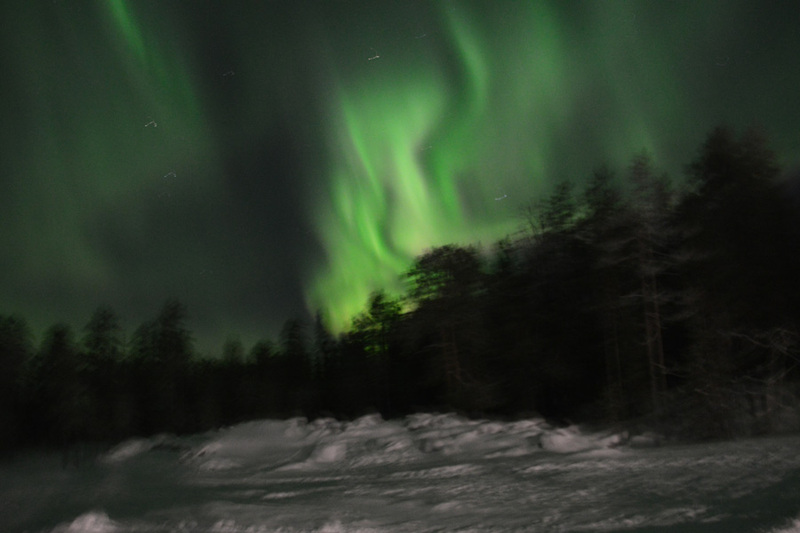 So when I was invited to visit Lapland, a remote and unknown-to-me corner of Finland, I jumped at the chance. To prepare for the negative 30-degree weather (and all the elements that accompany it), I scoured my storage unit to find my warmest gear and zipped over to REI, Ice Breaker, and Patagonia to fill in the gaps. Then off I went — a solo, middle-aged woman for an adventure in the Arctic. A mere five million people live in Finland, the majority in or near the capital, Helsinki. Lapland is Finland's northernmost region, a lightly populated area that borders Sweden, Russia, Norway, and the Baltic Sea. It's known for its vast subarctic wilderness, ski resorts, and atmospheric phenomena like the midnight sun and the Northern Lights. Getting here was relatively easy: non-stop on Finnair from JFK to Helsinki, then a 90-minute flight up to Lapland. I spent the first three days in Kuusamo at the and two days in the capital, Rovaniemi, as a guest of House of Lapland, the region's destination marketing company, who want to showcase Lapland's sustainability. Because sustainability is my expertise, I was only too keen to see what they're doing and how they are innovating in Lapland. As a single woman traveling solo, I felt totally comfortable, safe, and welcome from the moment I touched down. But with the friendly population and all the Nordic winter activities make this place perfect for so many kinds of travelers: families with children of all ages, retirees, and literally anyone craving an adventure amid the cleanest air on earth. What are all those delightful winter activities I did by myself? 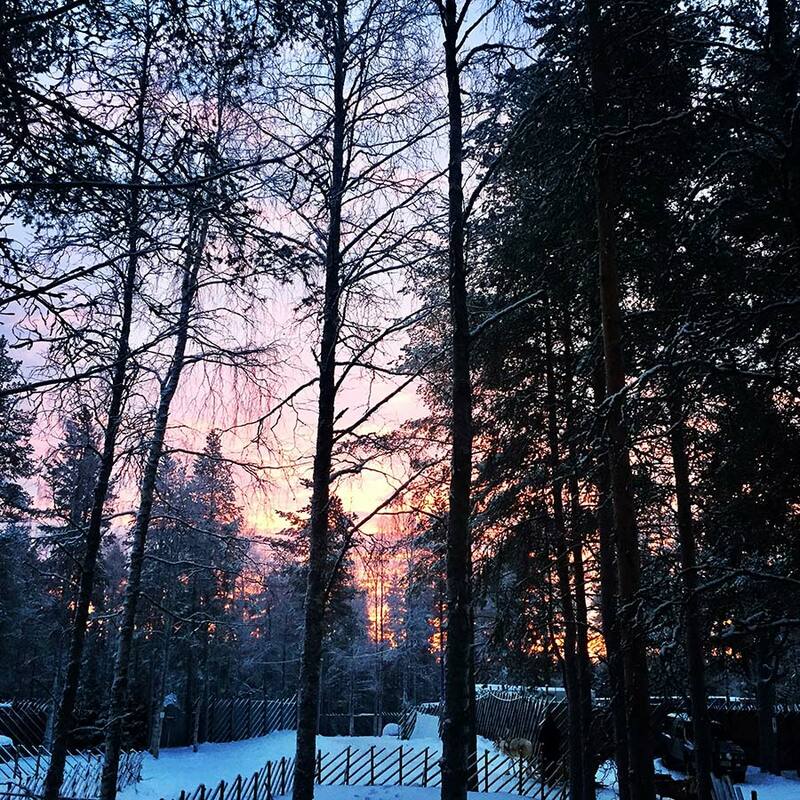 The complete Finnish sauna experience (not to be missed!). Snowshoeing. Downhill skiing at Ruka Mountain. 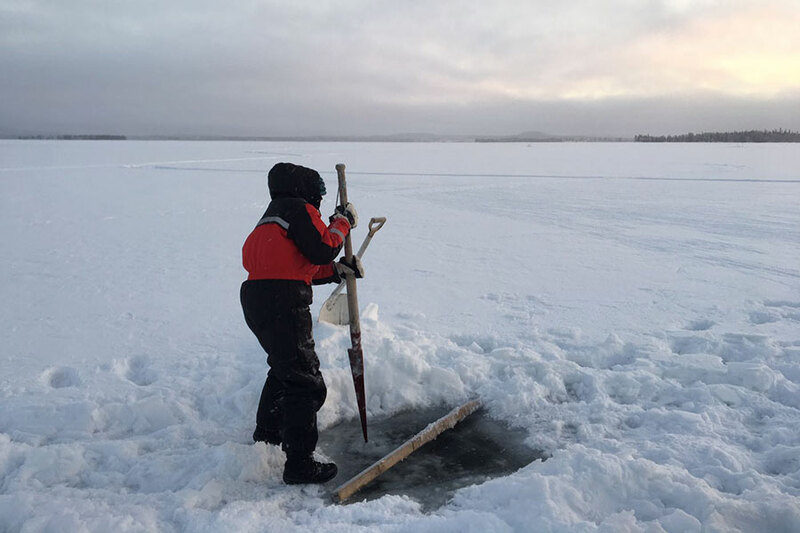 Ice fishing (then cooking our catch). Dog sledding (with the most adorable huskies). Meeting reindeer (at every turn). Sampling unusual and delicious cuisine (all locally sourced). Searching for and witnessing the Aurora Borealis. And learning about traditional . I needed a vacation from my vacation. 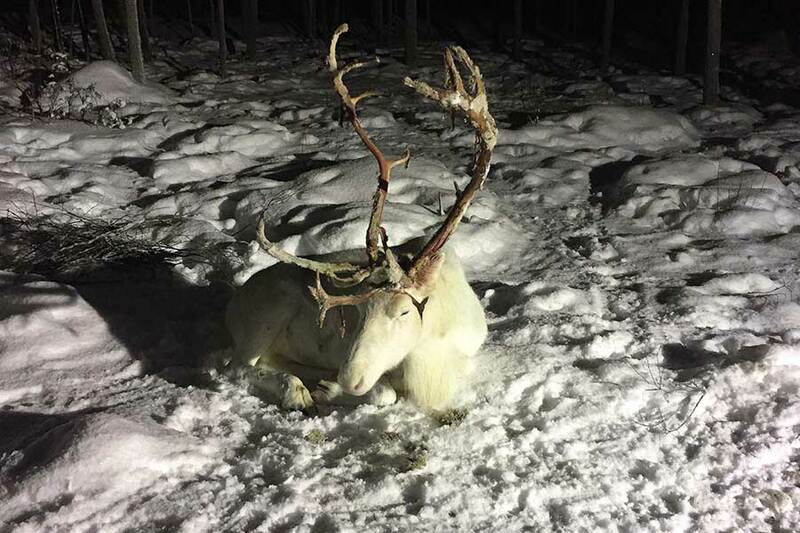 Reindeer. So many cute reindeer. Ice sauna at Rukan Salonki. 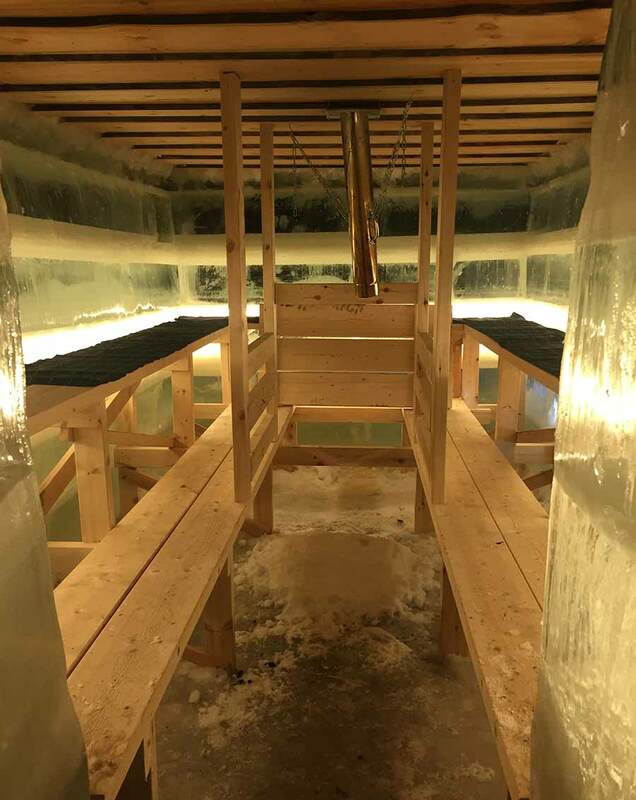 The ice sauna is made with sustainable wood. As an obsessive dog person, how did it take me until middle age to go dog sledding for the first time?! in all their glory pulled me through the woods as darkness approached. The biting cold prevented a long journey, but 20 minutes of fast, exhilarating sledding was an experience I will never forget. These pups were in their element, and I loved being in theirs. After sweating and shocking my body in frigid waters, I needed a sumptuous and soul-comforting dinner, which is what I got at . 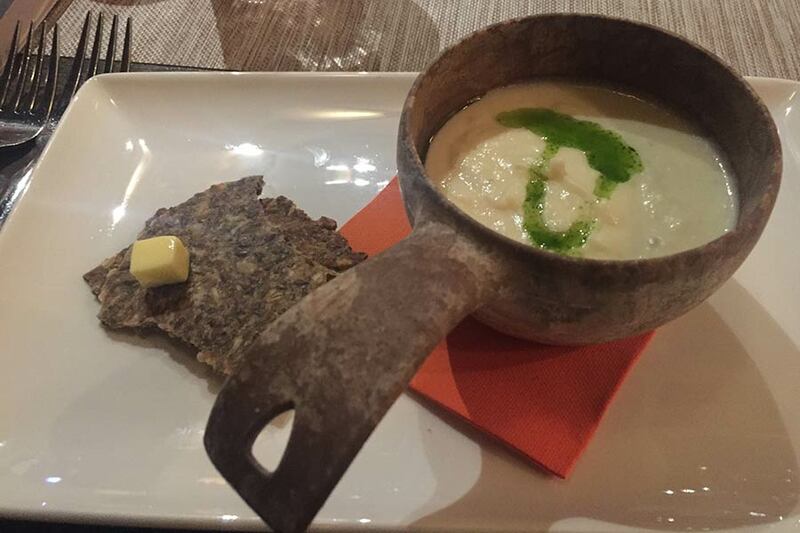 The meal began with a traditional Finnish gin and tonic with fresh juniper berries and rosemary, followed by cream of celery root soup, smoked salmon three ways (smoked, puréed in a creamy mousse, and grilled over a wood plank), and gratin of mushrooms. My dinner companions enjoyed reindeer — grilled, sautéed, and dried like beef jerky — but I don't eat meat. After dinner, I retired to my hotel, , located not a stone's throw from the ski action. My room had a small but useful kitchen and a sauna off the bathroom. A warm soup at Rukan Kuksa. Ice fishing is easy. If you've done it for 35 years. I never expected to love fishing in negative 35-degree weather. But the experience was magical. The sky above mirrored the ground — both a vast expanse of pale blue, the pillows of small pink clouds strewn above the only difference. The beauty made the bitter cold manageable. My guide, who had all but grown up on a lake, had been fishing for more than 35 years. He knew his craft so well that in less than 90 minutes, we had enough fish to serve ten for dinner. And to do so guilt-free: Lake fishing is sustainable in Finland. Downhill skiing at was next, and even though the temperatures were almost limb-numbingly low, I had several outstanding runs. I've been skiing for many years and I loved it. The resort is state-of-the-art in so many ways. The chairs on the lifts are covered, providing extra-warmth and protection from the winds. And continuous improvements over the years have made Ruka remarkably sustainable, with reclaimed wood in its various eateries, no plastic anywhere, and modern lift equipment that requires minimal power. The terrain is perfect for beginner and intermediate skiers who want amazing powder and gentle slopes without having to tap into their inner daredevil. If you are looking for exhilarating steep inclines, technical runs, and thrill-seeking descents, Finnish downhill is not for you. Take your adrenaline rush to Switzerland and Austria instead. A dreamy walk in Oulanka National Park. 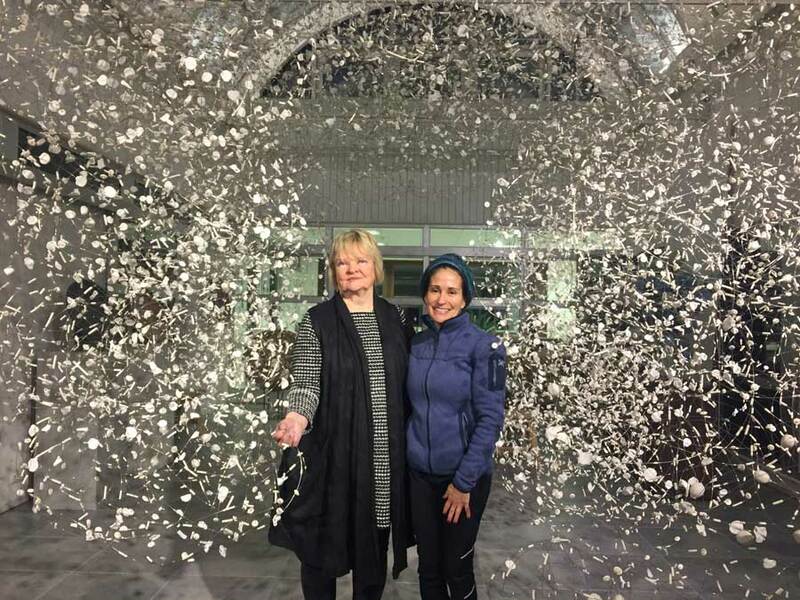 Ceramics designer Anu Pentik with author Susan McPherson. Photo by Susanna Chazalmartin. Morning began with a magical jaunt through less than ten kilometers from the Russian border during what felt like a heat wave. Around here, zero degrees Celsius seems almost balmy. In the afternoon, I visited the and artist residency run by visionary designer Anu Pentik, who launched her business in 1973 and is still going strong at 77, designing stunning pieces for retail and artistic shows. The evening showstopper was the sight that has driven many tourists to brave the bitter Arctic winter: the Aurora Borealis. The Northern Lights are a unique, natural phenomena, and they're everything they're cracked up to be. To find them, I wandered from my hotel away from the lights in downtown Rovaniemi to the banks of the river running through the small village. Gazing upwards, I saw green and purple clouds that appeared to be dancing to music, though the only soundtrack I heard was an occasional wind gust. This was a day of shopping, eating, exploring the capital city, , a magical village that claims to be the home of the "real" Santa Claus. You can picture the scene: Almost no traffic, and lots of small shops selling artisan products, fur, leather accessories, and handicrafts made by the local Sami people. Walking was the best way to get around. Nothing was far from my hotel. My goal was to visit shops owned mainly by women entrepreneurs, so my stops included , where I ate pastries made with local blueberries, raspberries, and gooseberries; — yes, they eat ice cream in the Arctic; and . I scored two reindeer hides for my Brooklyn home at . For kids, Santa's Village and are an extra special treat. After all, Lapland is the place Santa Claus calls home 364 days of the year. The Northern Lights just wouldn't stand still for a photo. Finnair flies direct from several major U.S. cities to Helsinki (HEL). From there, it's a two-hour flight to Kuusamo (KAO) or Rovaniemi (RVN) in Lapland. 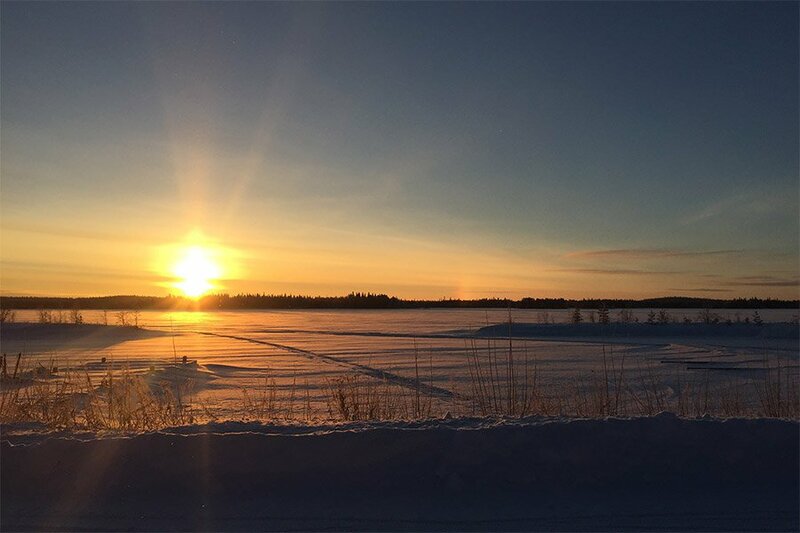 Smaller and more remote Kuusamo is home to the Ruka Mountain Ski Resort and a handful of restaurants and convenience stores, while capital city Rovaniemi, the gateway to the region, is an actual village with many restaurants, shops, galleries, and hotels. A car is best, as the area is sparse and taxis are few. When in Rovaniemi, walking is easy and comfortable. 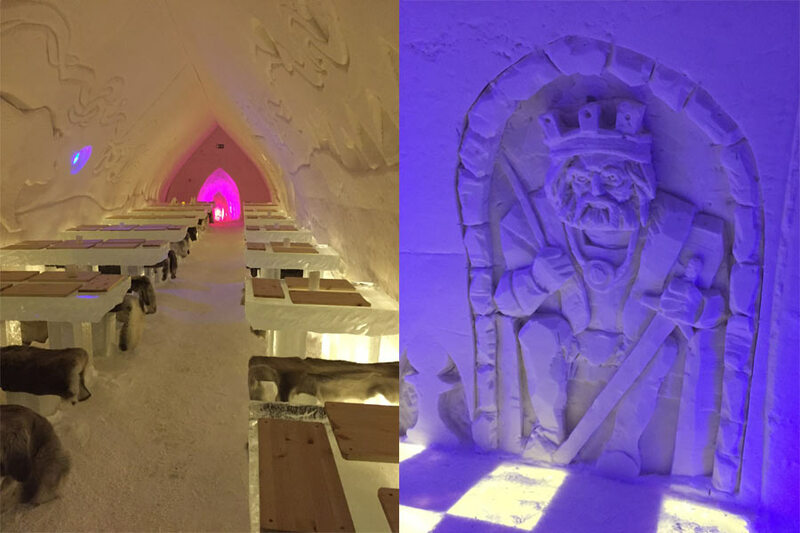 The carvings at Arctic Snow Hotel. I stayed at in Kuusamo and in Rovaniemi. Ruka Village is casual and ideally located, less than 50 meters from the chair lifts and an easy walk to the various restaurants and ski rental facilities at Ruka Mountain. New and contemporary Arctic Light Hotel in the center of Rovaniemi is notable for its award-winning restaurant. The two other hotels I liked are both very close to Rovaniemi. 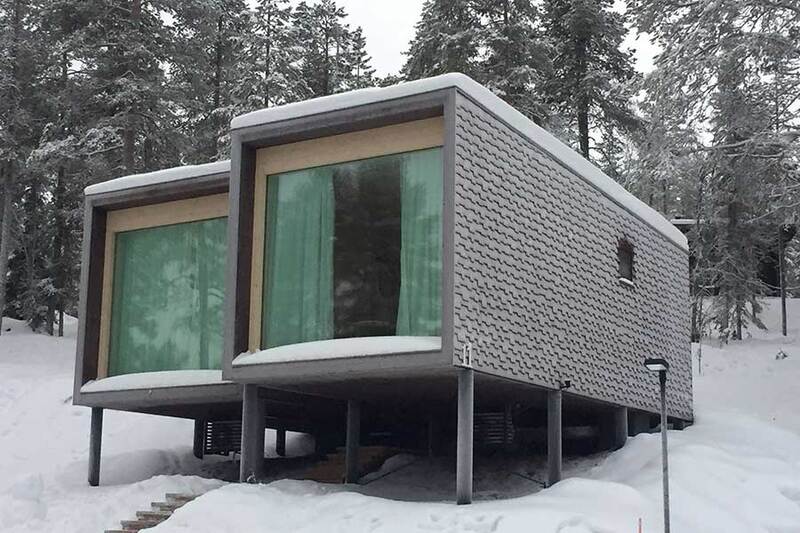 is a relatively new and very beautiful hotel with 32 individual units decorated with traditional Scandinavian, Lappish, and Finnish furnishings. But the showstopper is the glass wall that allows for unobstructed views, a feature totally optimized for viewing the Northern Lights. From your bed! 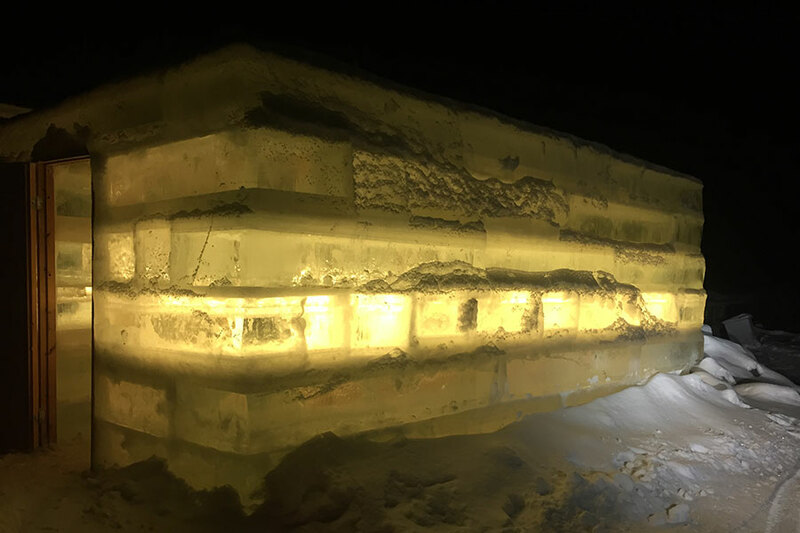 is an ice hotel where suites are made entirely of frozen water, every room individually decorated (essentially, ice-carved) by design students from the local university. Temperatures hover between 0–5 degrees Celsius. Sounds miserable, right? No. Because guests are wrapped in reindeer hides throughout the night, everyone stays snuggly and warm. Hostel café , the cleanest and most spacious hostel I ever have seen, is a fine choice for the budget conscious. If you have a stopover in Helsinki, I highly recommend , which opened in 1887 and was the first in the country to have an elevator. The charm, luxury, and elegance are still evident today, and the central location is unbeatable. Winter (November to April) is extraordinary, even with the many hours of darkness. It is also the optimum time to see the Northern Lights and experience the unique Arctic Ice Hotel and the Igloo Hotels. Sauna is a must. Wi-Fi is prevalent and free in most hotels and restaurants. Dress warm and casual, and you'll fit right in. is a serial connector who believes that business and travel can be forces for good. You can follow her at @susanmcp1 on and . She travels for the inspiration, the adventure, and to make new connections.